20th Century Fox Home Entertainment has released a new Christian film featuring a black Jesus. The movies producer Nu-Lite Entertainment (Hollywood, CA) reports that this movie examines the final 48 hours of Jesus Christs life before his capture at Mount Gethsemane. Jean-Claude LaMarre, an accomplished Haitian-American director/writer/actor, is directed the movie and also wrote the screenplay. Emmy winning actress Debbi Morgan (“Coach Carter,” “Woman Thou Art Loosed”) plays the role of Mary and TV personality/Host Ananda Lewis (MTV, Entertainment Tonight). By portraying Jesus as a black man, this movie may appear controversial to some. However, it stands to be the single most positive image of a black lead character in a film to date. This film will undeniably resonate in the hearts and minds of the black community and strike a cord of inspiration in the hearts of Christians of all ethnicities around the world. The films controversy lies in the portrayal of Jesus as a black Nazarene, persecuted because of his radical interpretation of the Torah. “Color of the Cross” tells a story that is familiar to most. The producer explains, However, since Jesus is portrayed as a black man, this version of the story of Jesus can examine the role that race may have played in the persecution, capture, and crucifixion of Jesus. The movie addresses four areas: Jesus and his disciples, the state of mind of the Romans occupying Judea, the issues facing the Rabbis in the Sanhedrin, and the family life of Joseph, Mary and their remaining children as they were affected by Jesus persecution. The movie opens with Jesus and the disciples approaching Jerusalem for the Last Supper and the film unfolds with the events leading up to Jesus capture and crucifixion. This extensively researched film remains true to Biblical and historical facts. 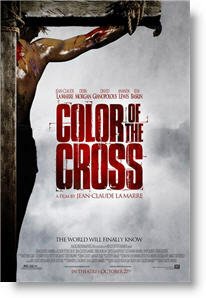 Rated PG-13 for some graphic crucifixion images, Color of the Cross features actor Jean-Claude La Marre (as Jesus Christ), Johann John Jean (Judas of Iscariot), Adam Green (Thadeus), Jesse Holland (Young Nicodemus), Nick Hodaly (Asphat), Akiva David (John of Zebedee), Michael Govia (Philip), Brendan Connor (Malchus), Shervin Davatgar (James), J.R. Dziengel (Matthew), Stephen Wozniak (Avraham), David Gianopoulos (Horatius), Eliezer Castro (Young Joseph of Arimathea), Elya Baskin (Caiphas), and Debbi Morgan (Mary). Blair Underwood played Jesus in a 30-minute short film titled “The Second Coming” (1992) produced by Quiet Fury Productions. In this film, the authorities accuse a black man wearing dreadlocks who calls himself Jesus of being a lunatic. We don’t know of any source for this movie. It does not appear to have been distributed or made available on video or DVD. Try contacting Underwood himself, as it was his personal project. Underwood was the director and financier. His manager is reportedly Ron West of Thruline Entertainment (Beverly Hills, CA).